Mount a sign or other printed item to any flat surface. 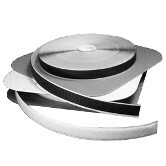 We carry tape with permanent or temporary adhesive, and magnet tape to attach signs to metal surfaces. 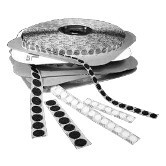 We have hook-and-loop tape for removable mounts, and adhesive dots and pads for more permanent mounting. You can also use double-sided tape to connect two different sign mounts to create a unique mount to fit your needs. Foam tapes have many uses for bonding display parts and mounting signs. We offer several sizes of high-quality permanent and removable foam tapes on rolls, pre-cut for ease of use. 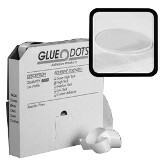 Glue dots are used to mount small product samples, coupons or cards to displays or to mail pieces. We stock glue dots on rolls of either medium-tack or high-tack removable adhesive, 4000 dots per roll. These gel mounts are clear, tacky plastic segments which can be used to mount signs on smooth, flat surfaces. 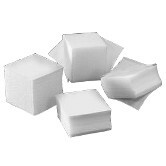 The segments are removable and reusable and can be cleaned using soap and water. They are ideal for window mounted signs since they are removable and nearly invisible. Adhesive-backed magnetic tape is ideal for mounting signs on metal shelving, racks, or refrigerators. We stock magnetic tape on continuous rolls, or segmented rolls at several lengths. Non-stock lengths are available as a custom order. 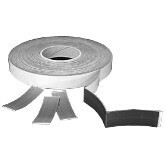 Our generic hook-and-loop tape is a cost-effective alternative to Velcro®. This hook-and-loop is useful in many ways for creating displays and affixing signs to a wide variety of surfaces. Available in black or white and a variety of widths. Hook and loop rolls are sold separately. Velcro® hook-and-loop tape is useful in many ways for creating displays and affixing signs to a wide variety of surfaces. 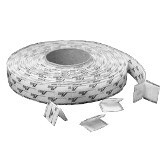 We carry adhesive-backed Velcro® in 3/4” and 1” widths on 25 yard rolls. Hook and loop rolls are sold separately. Velcro® dots are great for rapid assembly of displays and signs, These Velcro® hook and loop dots, also known as “coins”, are adhesive-backed. They remove easily from the continuous roll of liner material. Velcro® dot sizes range from 3/8” diameter to 7/8” diameter. Hook and loop rolls are sold separately. 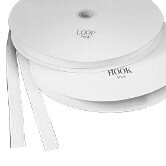 For rapid assembly of displays and signs, use these pre-mated Velcro® hook-and-loop segments. Adhesive backed, with a removable liner, pre-mated Velcro® squares are a popular product for a wide variety of point-of-purchase applications. 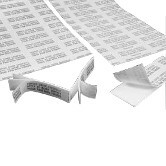 Pre-mated Velcro® segments are the quickest way to mount signs and build displays. 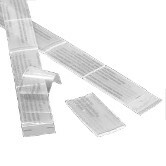 Sold as pre-mated segments of hook and loop, adhesive backed.